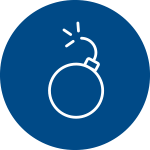 More than 95% of all bomb threats are hoaxes. However, there is always the chance the threat may be real. Therefore, appropriate action should be taken in each instance. In case of a bomb threat, the following procedure shall be followed. Immediately notify the Oklahoma City University Police Department by using a landline to dial 208-5911 (the use of cell phones may trigger a device). The Oklahoma City University Police Department will assess the threat, and will notify building occupants. Quickly observe his/her work area for any unfamiliar objects. DO NOT TOUCH ANY SUSPICIOUS OBJECT. Note its location and report it to police. When directed, follow the General Evacuation Procedures. Do not try to locate the bomb, and do not try to move the bomb if found. Move to and remain at the evacuation area. No one shall leave the area or attempt to re-enter the building without permission from an officer.